This week has brought some interesting perspective on life and living abroad. I’ve been back in the US for my grandmother’s 80th birthday party/family reunion and a brief visit to my parents (and also some quiet time to work on my MA dissertation). It was fantastic to see all of my aunts, uncles, and cousins in California for the birthday party — I’m really glad I went. It has also been nice to be in Rochester and not have any official household duties — of course I help out, but visiting the parents is different from living with F like a “real” adult; here, I can be a bit like a kid again, albeit a grown one. almost the entire family on my mom’s side (missing a couple cousins and partners), gathered in Ventura, CA for my grandma’s 80th birthday. Photo credit: Nancy R.
I lived at home for two months last summer, but that felt normal as I had only been in the UK for six months beforehand and was still on the heels of transitioning from Peace Corps/Ukraine life. Peace Corps was so different that returning to the western world was an adjustment in and of itself — it didn’t matter where I was, and there were so many changes that I had to take each one as it came. Open space. Americans often take for granted how much space this country has. On the flight from London to LA, my British seat-mate and I marveled at the hugeness of the land, particularly in the southwestern US, and at how much of it is uninhabited (and uninhabitable. And beautiful). Traffic and driving. Okay, so LA has crazy freeway traffic, but the Rochester streets are so peaceful! My dad and I were driving to Panera the other morning for breakfast (and endless coffee refills, yes!) and I remarked on how quiet the streets were. My dad replied, “Oh, I was just thinking it was pretty busy.” That’s perspective for you! It comes from living in London, where traffic is dense no matter the time of day. In a similar vein, driving has felt really easy here after cycling in London, where I have to be hyper-aware on the bike so as not to be run over by aggressive drivers. Cruising around in a car here feels quite calm in comparison. People and friendliness. Maybe I’m becoming more like a reserved European, but Americans are so friendly and open…sometimes overly so, it seems to me. I’m happy to strike up the odd amiable chat, and do it regularly in London with our fruiterer shopkeepers. But many people here seem a little too in-your-face-potentially-forced friendly. It’s fine, and I do appreciate the openness, but it’s funny to come at it now from another perspective — if anything, it reflects how living abroad has changed me. I will say that it’s refreshing to go into a store here and be able to ask an employee about what I’m looking for, because I know that they will provide good customer service and help me find what I need. In the UK and other parts of Europe it sometimes feels like people are mildly annoyed when you enter their shop…but I sort of like that, too — or at least am used to it by now! Oh, the cross-cultural life is always fun and interesting! I wouldn’t have it any other way — it has opened my eyes to how different people live and how different societies function, and has brought me a hefty dose of perspective along the way. I love it. One Year Ago: Four-B Pancakes (so good!) and Tabouli and News Roundup: The Humanities, Exercise & Addiction, etc. This entry was posted in community, culture, family, geography, Musings, pictures, travel and tagged life, London, money, Rochester, UK on 25.07.2014 by taplatt. Monday: S., D., and I each taught 30 minutes to our new class, the pre-intermediate group. We’ll now be evaluated by the other course tutor, Ben. The lesson theme was training, education, and jobs. S. opened with a really nicely staged reading activity. D.’s lesson consisted of lots of pronunciation and sentence stress work, which he led well. I taught the last section; my only guidelines for lesson planning were to prepare a free practice activity. I decided to have the students do a role play with job interviews. To begin, they matched pictures of people with jobs (biologist, musician, electrician, chef, etc) to the education/training they might have: culinary school, conservatory of music, Ph.D., apprenticeship, etc. Then I assigned each student a role — either a professional seeking a job or someone from an organization that wants to hire such professionals. They had some time to prepare questions/answers and then they interviewed each other. Overall it went smoothly and I focused a lot on all of my action points from the last lesson. Tuesday: Two useful input sessions with Bobby: evaluating coursebooks and getting some tips on planning our final 60-minute lessons. Our last two lessons will be one hour each; one lesson is a grammar lesson and the other is a skills lesson (focusing on two of the four skills: reading, speaking, writing, listening). Bobby led us through a general procedure for each lesson and then we had some time to plan with our teaching practice groups. We divvied up grammar and some of us chose topics for our skills lessons. Thursday: Observing A., Ir., and G. teach 30 minutes each to the pre-intermediates. Their context was money and millionaires, which A. did a great job engaging the class about. Ir. taught the best lesson I’ve seen him teach so far. He bungled a couple simple things, but his elicitation, boarding collocations, and drilling were impeccable. G. also taught a smooth lesson and staged a really nice “speed debate” activity at the end, which got all the students engaged and chatting away with each other. The pre-intermediate group is tricky. We haven’t had a full 12 people yet — 6 on Monday, 7 today — so that can make it tough to get discussion going. There are also a couple of difficult personalities; that certainly keeps us on our toes! This entry was posted in CELTA, education, language, literacy, teaching and tagged money on 01.03.2013 by taplatt. As 2012 comes to a close, I have been planning to write a “year in review” post. A fellow Ukraine PCV posted a great one yesterday and I was inspired to snag an idea or two from her (thanks, Kristen!). What else can I say about 2012? I just looked back at my intentions for 2012 (written at the end of 2011) and was pleasantly surprised to see that I accomplished/achieved pretty much all of them! It was an exciting year: new experiences, visitors to Ukraine, meeting friends abroad, some tragedy, big transitions, and more. I learned a lot about myself and feel like I grew as a person — if only in that amorphous, hard-to-pin down way. Learn my way around a new city (London). Live frugally in an expensive city / take advantage of free and inexpensive opportunities there. Get a bike and start cycling more, for commuting and exercise. Remain balanced by continuing to eat healthily, exercise (run/yoga/swim/bike), and make time for myself. Start an MA program in English literature (this should happen, as long as I get accepted somewhere). This entry was posted in books/literature, celebrations/holidays, education, exercise, family, food, health, Highlights, pictures, running, travel and tagged money, New Year on 31.12.2012 by taplatt. This entry was posted in culture, health, religion and tagged government, money on 14.04.2012 by taplatt. Ukraine’s per capita GDP places it among the lower- to middle-income countries. The country has a highly-trained professional labor force, fertile agricultural land, and a wealth of raw materials, metals, and natural resources. So why do they need the Peace Corps, you may ask? Well, after declaring independence in 1991, the Ukrainian government liberalized most prices and created a legal framework for privatization. But reform efforts soon stalled, leading to 8 years of sharp economic decline. Because of this, the country needs help with improvements like fighting corruption, developing capital markets, and improving the legal framework for businesses. On the positive side, the U.S. and E.U. granted Ukraine market economy status in 2006, helping pave the way for its joining the World Trade Organization (WTO) in 2008. Because Ukraine wants to get a strong foothold in the world economy, Peace Corps Volunteers work in many areas of business, community development and education (see previous post). ₴), which subdivides into 100 kopiyok. 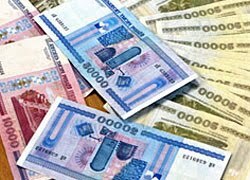 According to Wikipedia, the current exchange rate is 8-8.25 UAH/USD. And according to the above image, it is quite colorful currency! This entry was posted in Peace Corps and tagged economy, money on 12.07.2010 by taplatt.